FanWide partners with Cliff Avril (Seattle Seahawks Super Bowl Champion and 2016 Pro-Bowler) to help develop its nationwide network of sports fan clubs. I am excited to be joining the FanWide team and to help a Seattle tech company grow its business nationwide…I love FanWide’s mission to help people find a home through sports, wherever they live or travel. FanWide – http://www.FanWide.com – the digital platform dedicated to helping out-of-market sports fans find a local fan club or game watch party, has just added Cliff Avril to its team as a brand ambassador, advisor, and investor. Since launching in 2016, Seattle-based FanWide has promoted almost 750,000 events for 12,500 organizations nationwide. FanWide has developed the world’s largest fan club database for the NFL, NCAA Football, NBA, NCAA Basketball, MLB, NHL, professional soccer and esports. 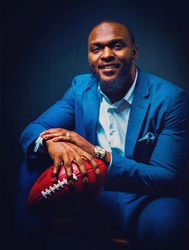 Cliff Avril is currently a daily on-air host for Seattle Sports Radio 950 KJR and runs the Cliff Avril Family Foundation – a charity dedicated to promoting healthy living and providing educational opportunities to the youth of Haiti. Cliff recently retired from the Seattle Seahawks after being one of their defensive line stars since 2013, helping them win Super Bowl XLVIII. In 2016, Cliff was named to the Pro Bowl and was ranked as one of the best players in the league for 2017. Prior to the Seahawks, Cliff played for the Detroit Lions from 2008, after a standout career at Purdue University. FanWide is a free website and app that connects sports fans from every team in any city through in-person meetups organized by local fan clubs. In addition to promoting existing in-person game watch parties, FanWide also develops new communities for over 1,000 pro, college, and international teams. The company promotes events at over 10,000 sports bars nationwide and engages fans with prizes from sponsors. FanWide encourages athletes, sports influencers, sponsors, and investors to contact the company if they are also interested in learning more about the business. FanWide was recently named “the most disruptive technology likely to shape the future of basketball” by Spalding, Puma, the Naismith Committee, the LA Dodgers Innovation Lab, and others after winning the HYPE Sports Innovation Global Competition (Yahoo! Finance - February, 2018), and they are focusing on pro and college football this fall. For more information on FanWide, please visit http://www.FanWide.com. FanWide - http://www.FanWide.com - is a free website and app that helps sports fans find the closest fan club or game watch party for any team in any city, while rewarding the fans for engaging with each other and sponsors. FanWide manages the world’s largest database of sports fan clubs and provides services for fan clubs and alumni associations, pro and college teams, corporate sponsors, athletes and influencers, and TV broadcasters.